Children's Etiquette Classes - Finesse Worldwide, Inc. 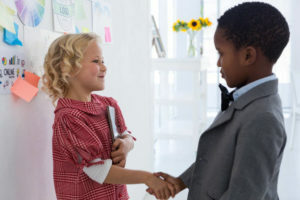 Encourage your child to make a great first impression by learning basic etiquette and social skills that will benefit them for many years to come. Aimee Symington’s Children’s Etiquette Classes are the perfect place to start! Choose a class, register, and send your child on their way to success! Feel more comfortable in all social settings. Know how to confidently greet people and make polite conversation. Make friends more easily and impress their teachers, coaches, and others. Understand how to use cell phones, email and social media safely and with respect for others and themselves. Feel comfortable dancing the Shag and Waltz. Interactive with activities and games. NOT “stuffy” or “boring” according to kids! Relevant and teaches what children need to know now in our modern world.